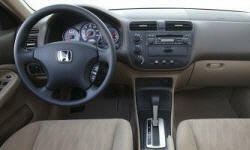 2004 Honda Civic Pros and Cons | Page 1 of 1 | Why Not This Car? What drives people to buy (or not buy) a certain car? 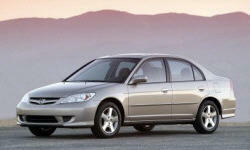 TrueDelta's members share 2004 Honda Civic pros and cons based on their real-world driving experiences. Rear seat does not fold down. Trunk is small. This is a capable commuter car, but cannot serve as a family vehicle due to this liability. Hybrid gives *great* economy - 45 mpg is normal. Except for the bad transmission, this little car runs like the proverbial Swiss watch. The civic has excellent fuel economy. When gas got over 3 dollars a gallon I was feeling it a lot less than all those peopel who bought gas guzzlers! At the time I bought the car new, with the 2.3 liter engine and all the features I wanted, for $17000, including all taxes and fees. I consider that a deal. Gas mileage at between 34 and 38 mpg is really good but since the car is also a lot of fun to drive the fuel economy is terrific!